Being a Nigerian entails a lot of things, it is the uncanny knack of us being able to find humour in the dark and pride of the day. It is glaring in our religious temperaments, the way we worship on Sundays and Fridays. It is in the colours of our ethnicity, the way we greet and the languages that we speak, the clothes we wear, from the buba to the gele, the kaftan and the isiagwu, Nigeria is no short of a rainbow country. Flushed with over 200 million people speaking over 250 different languages, and numerous tribes within tribes and cultures pre-existing the formation of the country, Nigeria is multi-diverse, we have in ourselves our form of unity. We celebrate this united front during the Independence Day every October 1st, or in our festivals like the FESTAC in Lagos and the Calabar International Carnival in Cross-River State. Amidst the many things the country is known for, Nigeria is also known for its food. Food in Nigeria is dependent on the geographical region and each geographical region has in its self a cultural rev that pushes the food force that exists in these regions. Hence, what is food to the Hausa man of the North may not be food to the Urhobo man in the South. Unlike in some countries where food is defined by weather conditions or time of day, in Nigeria food is defined by taste. To us, if it jumps our taste bud merrily then it is worth eating at any time. We take hot tea at noon and pounded yam for breakfast, food for us is an art, and we take our time to prepare it in the best ways possible. It is why noodles to us when well prepared have all the garnishing of a sauced meal; Fried tomatoes, green peas and carrots when the pocket is smiling. The delicacies that are founding in these food content are as defined by the people that occupies these areas, however food in Nigeria travels across states, among the many food that exists, food still goes the extra mile, it is why the Hausa man in Kano have somehow come to find the Juicy taste of Edi Kang Ikong delightful and the making of grilled meat a Hausa delicacy commonly known as suya. Aside from the norms and cultures that identifies us as a people; you are not Nigerian if you havent eaten Jollof Rice. Visiting the country, some may argue that eating Jollof rice is a part of pertinent cultural necessity that is available to all cultures and tribes, Jollof Rice to the average Nigerian is a national dish. The dish which traces its history to the Wollof people of Senegal has been gaining grounds in the continent over time. The content of Jollof rice is varying from chef to chef. How Jollof Rice is prepared is dependent on personal interest. A chef once told me that when preparing Jollof rice the outcome of the taste usually is as a result of how much steam the pot has endured to how far off the rice is cooked. Before the rice goes on the fire first, prepare the tomato stew. If you will use whole chicken then wash and cut it into pieces. Cook with the thyme, seasoning cubes and 2 bulbs of onions (chopped). The cooking time depends on the type of chicken. The rooster or cockerel cooks much faster than the hen but the hen is definitely tastier. When done,grillit in an oven. You may also fry it. This is to give it a golden look which is more presentable especially if you have guests for dinner. Rinse the parboiled rice and put in a sieve to drain. Add the drained parboiled rice, curry powder, salt and pepper to taste. Thewater levelshould be the same level of the rice. This is to ensure that all the water dries up by the time the rice is cooked. 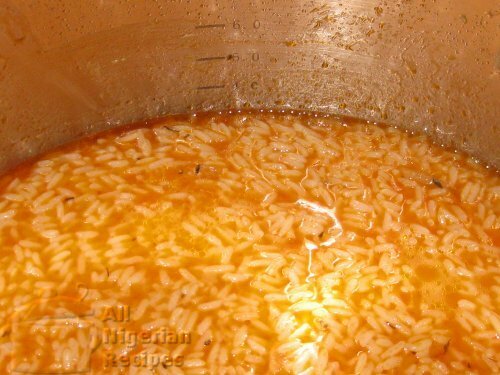 If you parboiled the rice as described atparboiling rice for cooking jollof rice, the rice should be done by the time the water is dry. Taste to confirm. If not, you will need to add more water and reduce the heat to prevent burning. Keep cooking till done. Jollof is best served hot and could also be served with Moi Moi, Salad, Coleslaw and Fried Plantain depending on preference. And the icing on the cake is usually a cold soft drink to push it all down.